‘We are the schmucks’ thundered President Donald Trump, using a favorite New York City Yiddish term. The object of Trump’s wrath at his Make America Great Again’ rally in Great Falls, Montana was the craven, stingy European members of NATO, only 16 of 22 members are on budget for their US-commanded military spending. Trump wants them to spend much more. Equally bad, according to Trump, is that the US runs a whopping trade deficit with the European Union which is busy shipping high-end cars and fine wines to the US. The wicked foreigners don’t buy enough Amerian bourbon, corn and terribly abused pigs. But the Europeans ask, ‘defense against whom?’ The Soviet Union was a huge threat back in the Cold War when the mighty Red Army had 55,000 tanks pointed West. Today, Russia’s land and navel power has evaporated. Russia has perhaps 5,500 main battle tanks in active service and a similar number in storage, a far cry from its armored juggernaut of the Cold War. 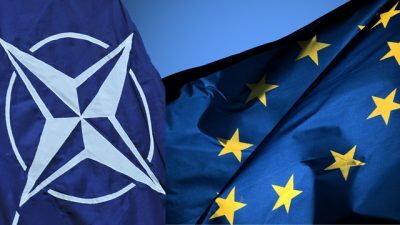 Equally important, most civilians don’t understand that neither US and NATO forces nor Russia’s military are in any shape to fight war that lasts more than a few days. Both sides lack munitions, spare parts, lubricants, and battlefield equipment. The overworked US Air Force, busy plastering Muslim nations, has actually run low on bombs. US industry can’t seems to keep up supplies. There has even been talk of buying explosives from China!